Many investment specifications have a button that reads Save Data As. Clicking that button opens the Save Output Dataset dialog box (see Figure 59.1). This dialog box enables you to save all or part of the area generated by the specification. Browse opens the standard SAS Open dialog box, which enables you to select an existing SAS data set to overwrite. Dataset Label holds the SAS data set’s label. Dataset Variables organizes variables. The variables listed in the Selected area will be included in the SAS data set. You can select variables one at a time, by clicking the single right-arrow after each selection to move it to the Selected area. Click the double right-arrow to select all available variables. Remove any unwanted variable by selecting it from the Selected area and clicking the single left-arrow. The double left-arrow removes all selected variables from the proposed SAS data set. The up and down arrows below the Available and Selected boxes enable you to scroll up and down the list of variables in their respective boxes. Save Dataset attempts to save the SAS data set. If the SAS data set name exists, you are asked if you want to replace the existing SAS data set, append to the existing SAS data set, or cancel the current save attempt. 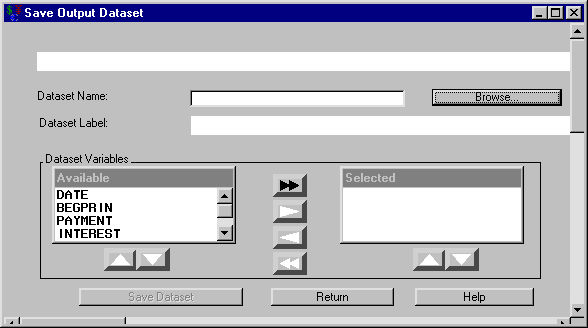 You then return to this dialog box ready to create another SAS data set to save. Return takes you back to the specification dialog box.